Keith Huffman lives with his family in Broomfield, Colorado (a suburb of Denver), and he earns his living in the software and IT industry. During his off hours, Keith has helped multiple non-profits (including Ascend Performing Arts) with their web and social media presence. Between 2006 and 2015 Keith volunteered for the award-winning high school marching band where his two children attended – in pit crew, as prop builder, and from 2013 to 2015 as Logistics Coordinator and marching festival staff. Keith also volunteers for a local independent open winterguard group by shooting rehearsal videos, helping with their website and social media, and building tarp carts. 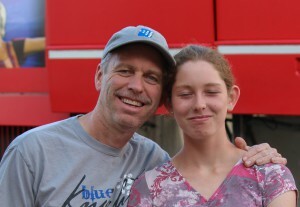 Keith is proud that both of his children have experienced the Blue Knights Drum and Bugle Corps as performers. His son Justin played Baritone Horn in 2009, and his daughter Kirsten has been a member of the Color Guard since 2013. Since 2009, Keith has been involved with the Blue Knights as a parent volunteer, and he is also pleased to be in a position to contribute his talents and spare time to Ascend Performing Arts. Since 2013, Keith has worked as the Blue Knights Volunteer Coordinator, provided hands-on help at audition/rehearsal camps, and helped with the Ascend Performing Arts social media development.